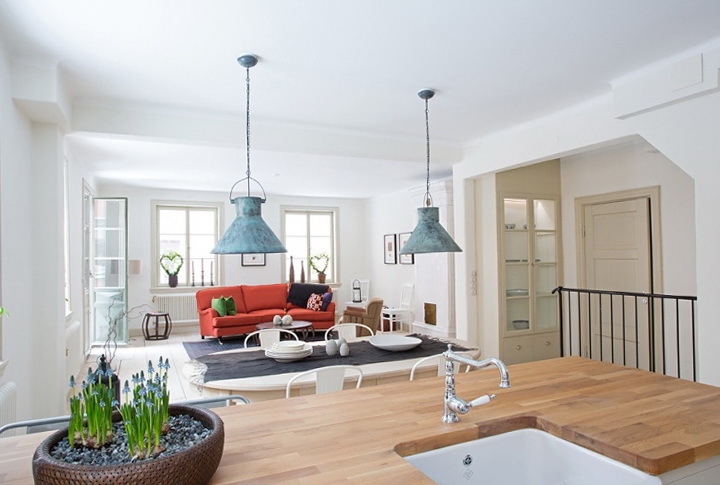 This apartment is combined with various styles, interiors can be very diverse and interesting. 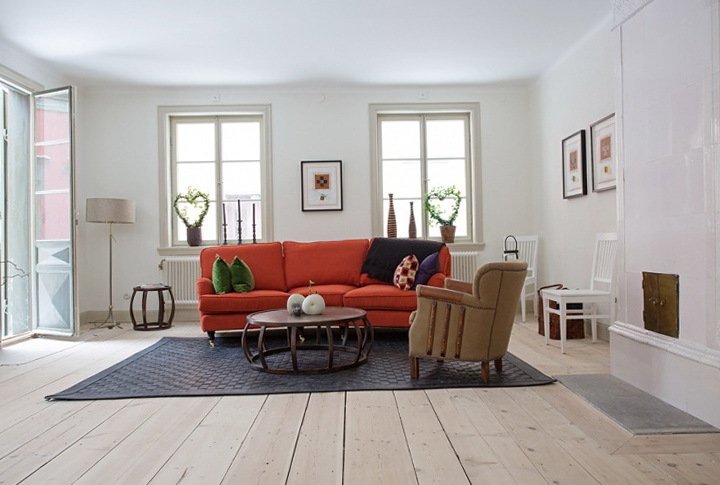 The main style – Scandinavian, rustic style, and the style of minimalism. 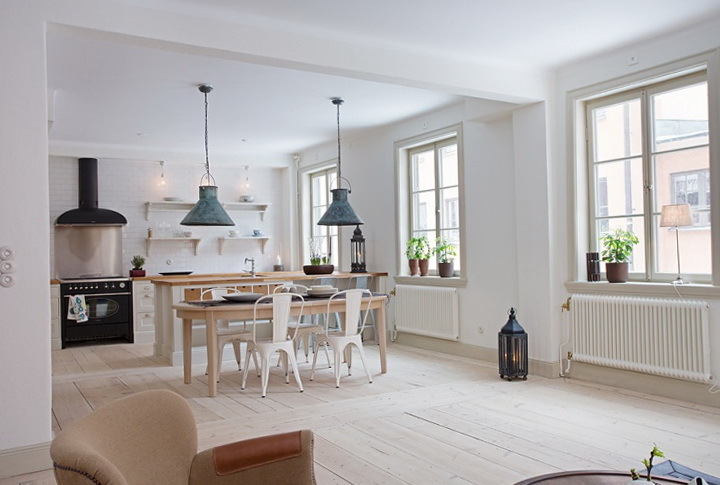 The apartment includes a kitchen, sitting room, dining room, bedroom and bathroom. 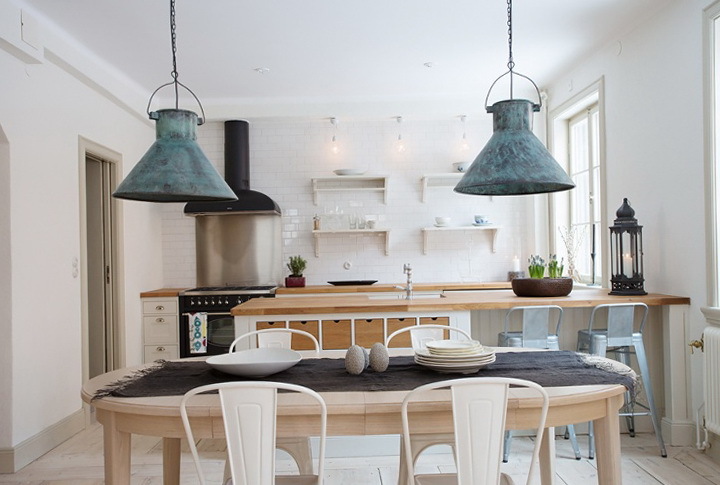 Should pay attention to industrial objects in the interior, such as the lamp above the table look really rustic. Color bright kitchen skillfully blends well with the color of the floor, which is really bright and pleasant to the eye, moreover they have one texture. 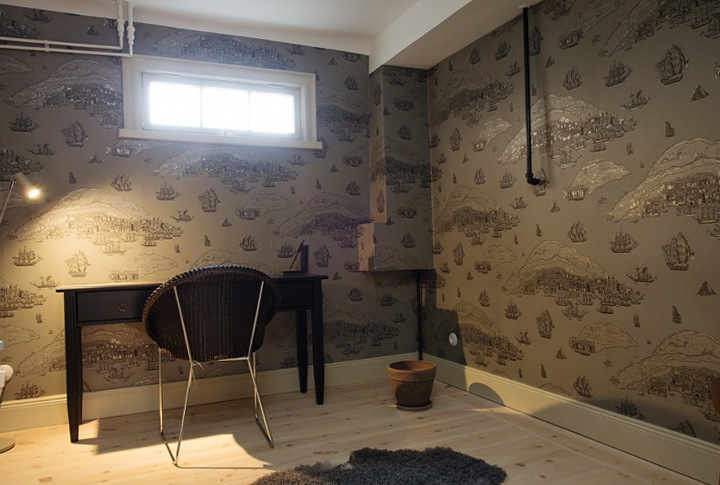 Workplace done in Nordic style with an interesting sheen on the wallpaper in the room very little light, because there are no large windows, but if a small lamp. Near the wall is a small table for the job. Sofa in interior detracts from all other objects, it has a simple frame, but a bright color – red, which enlivens the room. The sofa becomes a central space in the interior. 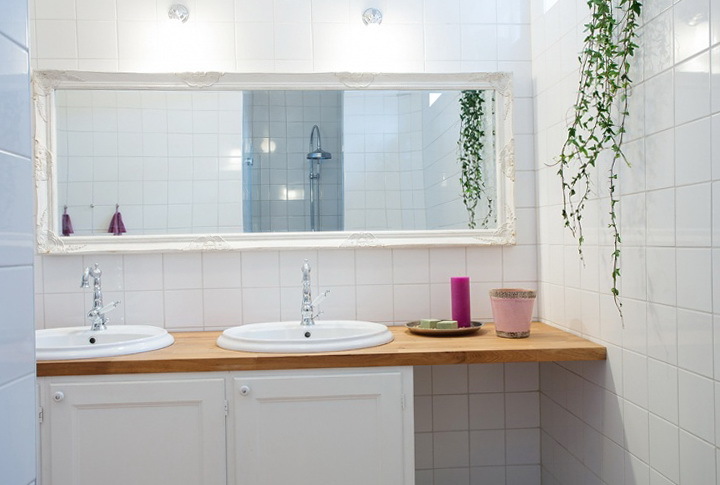 This interior can vary bright objects and details that can be easily modified. Dining table in the kitchen is dressed in a simple black handkerchief, looks very nice and simple. Due to a lean shelves in the kitchen open shelves Mr. White that you can locate the jar with cereals and tea. Pluses apartment that she has plenty of open space, lots of windows giving the apartment the day lighting. 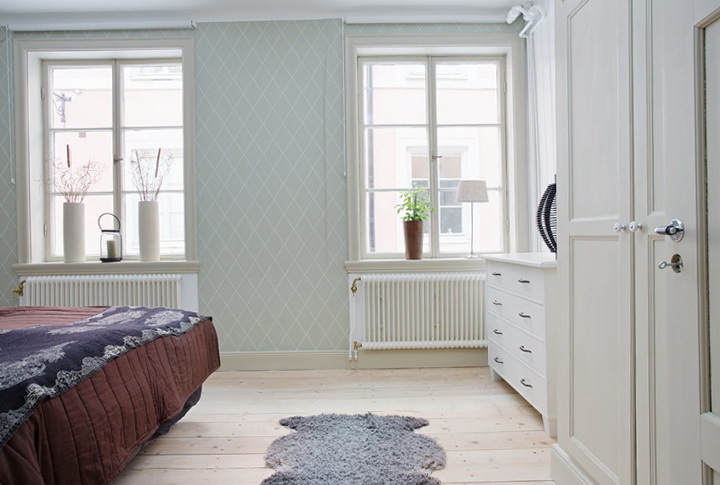 The room looks a little cool, but if it is to decorate beautiful and bright curtains room sparkle is different. 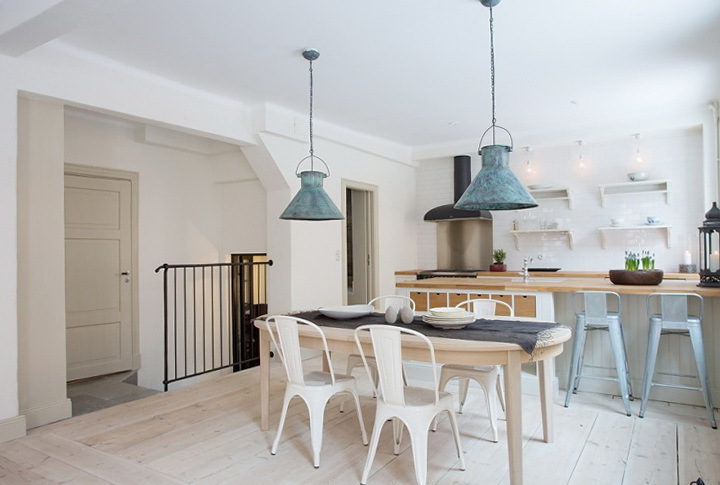 The owners of this apartment have got an old stove, which blends well with Scandinavian style, white tiled stove pasted, despite its large size, it is covered in a blank wall.